Fondant Recipe for cakes - Homemade Veg Fondant Recipe without glycerin, marshmallow, corn syrup and glucose. 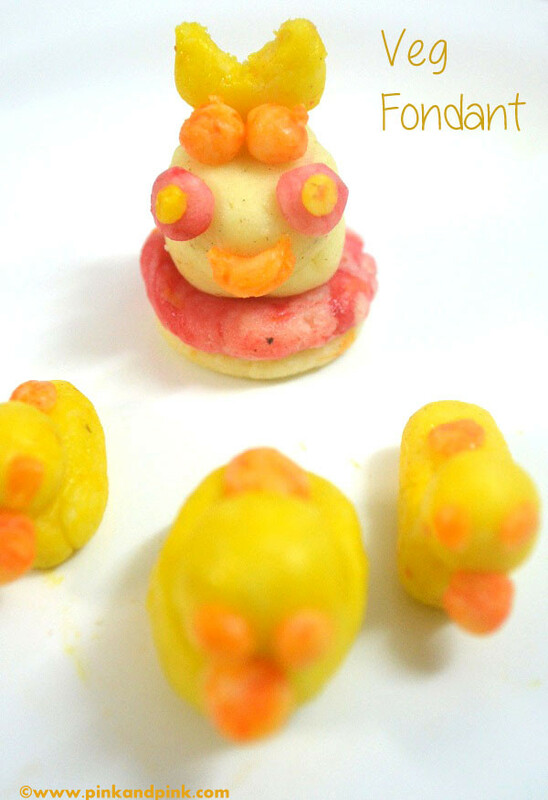 A very simple fondant recipe which any one can make easily without any hassle. The homemade fondant made using this recipe will be having the flavor of milk powder dominantly as we are using milk powder as the main ingredient in this fondant recipe. Before some years, people showed their creativity in icing. Nowadays fondants are becoming popular. People like customized cakes with fondants according to their interest and occasion. I have thought that I would order a cake with fondant for my kid's birthday. But I have never done it due to my location. I am located far away from the main city where creative bakers are located mostly. I am sure that cakes with fondants are more expensive when bought outside. I had never thought that I would make fondants at home one day in my life and it happened on my beloved kid's birthday. I seriously had no thoughts to make homemade fondant for my kid's birthday. It was completely accidental. I had planned for making an eggless chocolate cake and white icing cream for decorating. I had also marked to buy cherry in the shopping list and went for super market located inside my apartment. Cherries were not available on that day and I worried how to decorate the cake without cherries. Cherries used to be available all the time in that super market and it was a really shock to me. My hubby already told me that he would come late on that day and asked me to take care of everything. 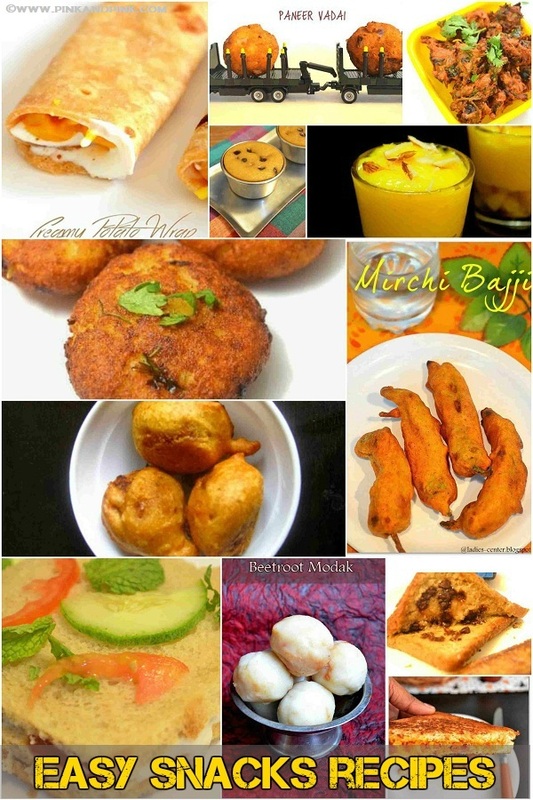 Check pressure cooker cake recipes which I have already posted in this blog. I was searching for other ways to decorate the birthday cake. Most of the websites suggested to use fondants. But all the fondant recipes were using one or more of the following ingredients - corn syrup, marshmallow, glycerin and glucose. I did not have any of those things in stock and I was sure that the super market would also not have. I kept searching for veg fondant recipe without corn syrup, glycerin, marshmallow and glucose. 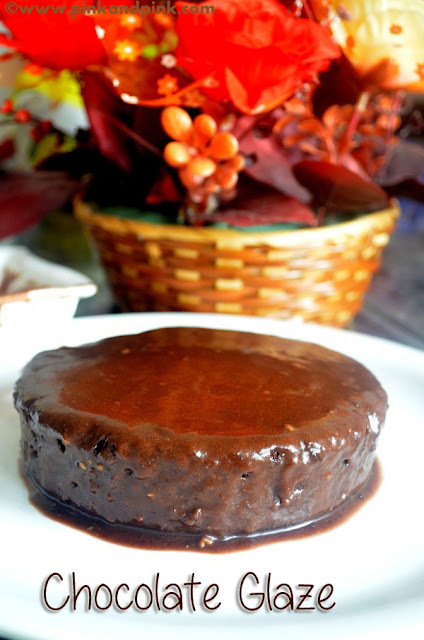 Most of the veg fondant recipes suggested to use agar agar for making fondant. I did not have that too. So, I have decided to quit the idea of making fondant and try something new. I got ready to make eggless chocolate cake first and then to think about decorating. When I was taking the required ingredients from my grocery shelf, I found a milk powder pack which was lying unopened for a long time. As I had idea on how to make fondant by searching various fondant recipe for cakes, an idea suddenly came to my mind to make fondant with milk powder. Are the ingredients of fondant really matter? Certainly, No. I immediately started making homemade fondant with milk powder. 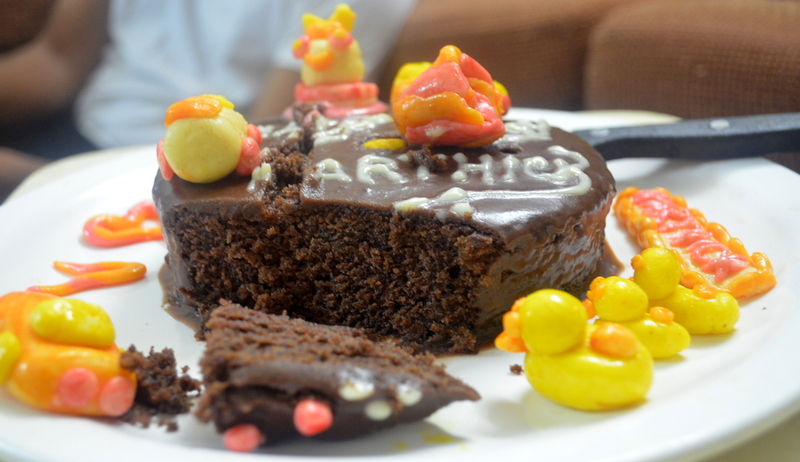 That is how I came up with this simple fondant recipe for cakes. This simple fondant cake is so flexible and stretchable. 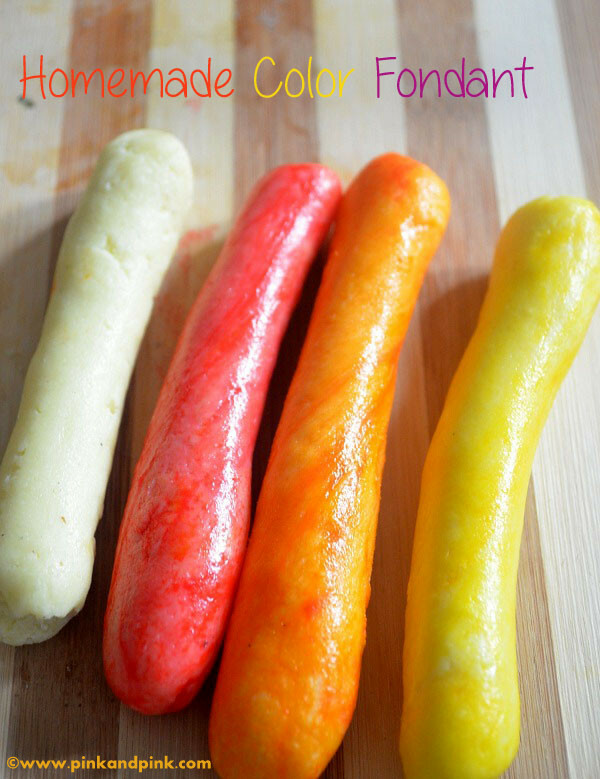 You can easily add color to the homemade fondant recipe. What else one would require to make elegant fondant for cakes? Thanks for the super market which did not have cherries in stock. Otherwise I could not have tried to make homemade veg fondant for cakes. Shelf life of Homemade Fondants made by this recipe is a minimum of 1 week. I have not tried storing the fondant dough longer that. 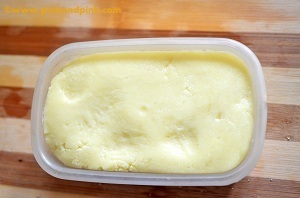 You must need to keep it in an air tight container and store it in fridge for longer shelf life. If you have condensed milk at hand. Then it is a no-cook fondant recipe for cakes. Now let us see how to make simple homemade veg fondant without glycerin, corn syrup, marshmallow and glucose and glucose. 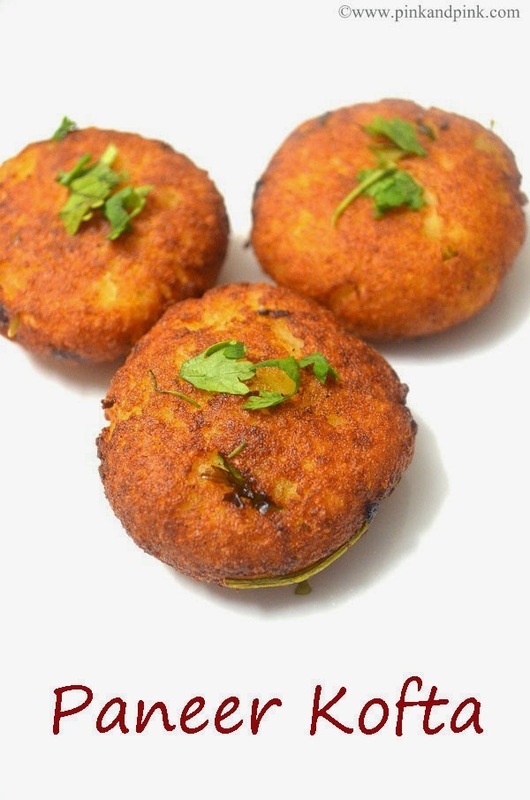 Learn how to make simple homemade veg fondant easily at home. In this homemade fondant recipe, measurements are just indicative and the quantity which I have used for making fondants. It varies based on different factors like thickness of ingredients, sweetness of sugar and condensed milk, the intensity of the food color etc. The basic thumb rule in making homemade fondant is adding ingredients little by little till you reach the desired consistency and sweetness. If you have condensed milk at hand, ignore this step. Otherwise take 1/4 cup of milk and mix custard powder or corn flour. Mix well without any lumps. Heat the boiled milk in a pan. Add the corn flour and milk mixture in the pan. Keep stirring till it reaches the condensed milk consistency. 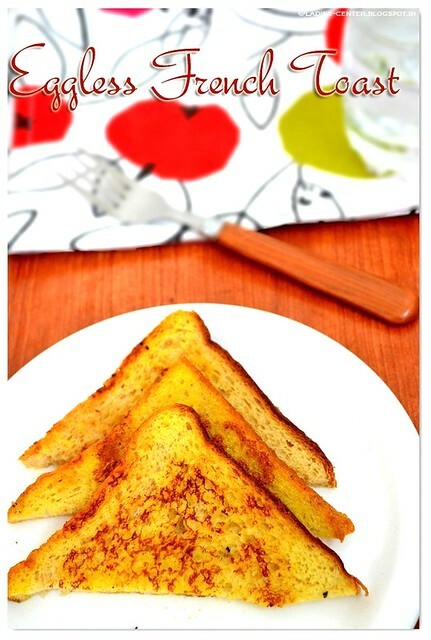 It should reduce to the half of the original quantity of the milk. 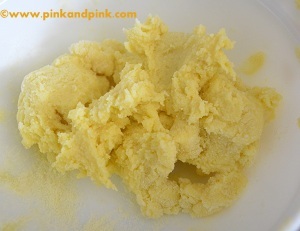 If you do not have both corn flour and custard powder, you can add plain boiled milk. The taste will be little different. But the homemade fondant will be still tasty. Skip this step if you have icing sugar at hand.If you do not have icing sugar, powder the sugar and sift it. The sugar should be a fine powder. Otherwise it will be like biting stones when you eat fondant. So, the sugar should be a very fine powder like icing sugar. So, sift the powdered sugar well. If you are still in doubt, just add a tsp of water and melt the sugar. Or else you can add the sugar while making the homemade condensed milk. Take a wide mixing bowl. If you are using store bought sweetened condensed milk, you can reduce the quantity of sugar if you desire. 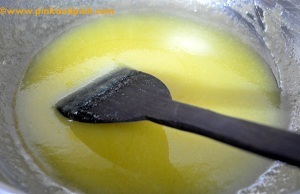 Add lemon juice, milk powder and required quantity of sugar. Mix gently. You can add sugar little by little as and when required instead of adding everything in one shot. Slowly add the condensed milk and keep mixing. You might not need 3/4 cup condensed milk. I had to use a little more than half cup of condensed milk. Roll it till you get a non sticky fondant dough. Add milk powder if the fondant dough is sticky. If the fondant dough is so hard even after adding condensed milk, you can add regular milk. White Fondant dough is ready now. You can store this in an air tight container and use it later. Now we are going to infuse colors to the fondant. Based on my experience, food colors in powder form works best and it is so easy. I have used rose milk essence for pink color fondant, yellow kesari powder for yellow color fondant and orange kesari powder for orange color fondant. I have found that the liquid form of color is little bit difficult to use than the powder form. Divide the fondant dough according to your preference. I left one portion as such to use it as white fondant. Actually it was cream color fondant and not pure white. I have added the colors to the other portions. Add color little by little. It takes time to mix the color evenly to the fondant dough. So, mix it well gently. 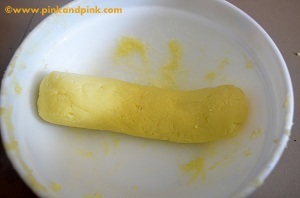 Grease your hand with coconut oil if the fondant dough sticks to your hand. Homemade fondants are ready to use. Start making different shapes and play with the fondants as you like. 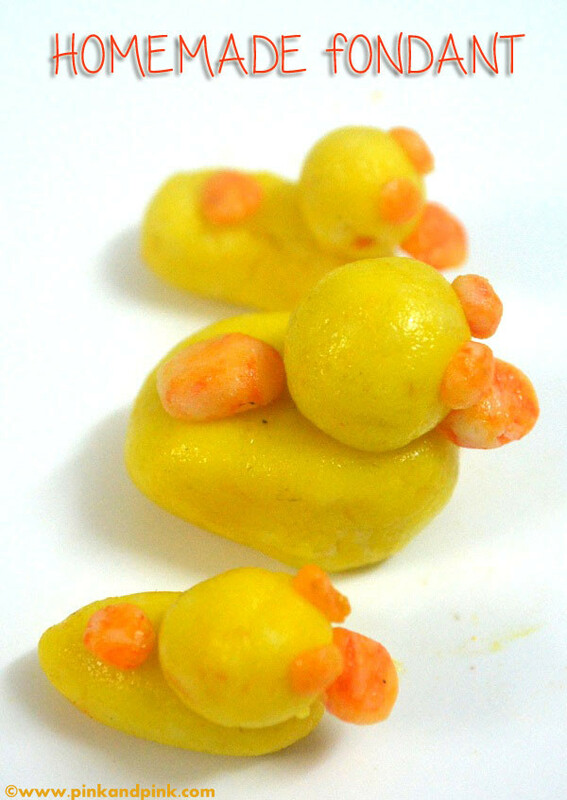 Try this simple homemade veg fondant recipe for cakes and delight your little ones. 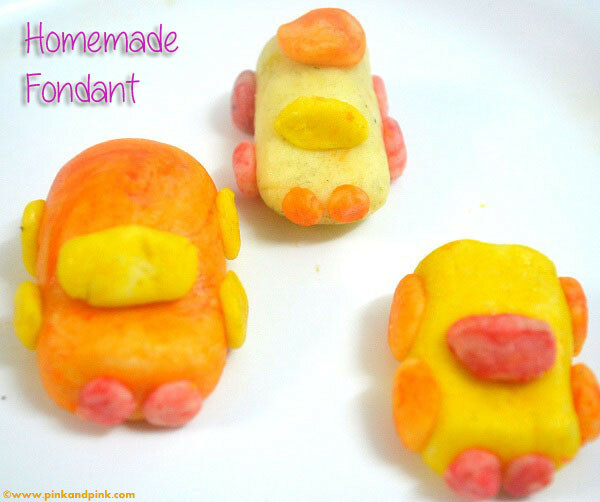 I am sure you and kids will have great time playing with fondants. I thoroughly enjoyed making different shapes with fondants. Hope you will also enjoy. Wowww looks so yummy... Love the color.. Thank you so much!! Your comment made my day! Can I use milk instead of milk powder, if yes what quantity? I don't think so. You can try. Amazing idea. I used to do 3D shapes wth butter icing. This tym tried ur fondant. 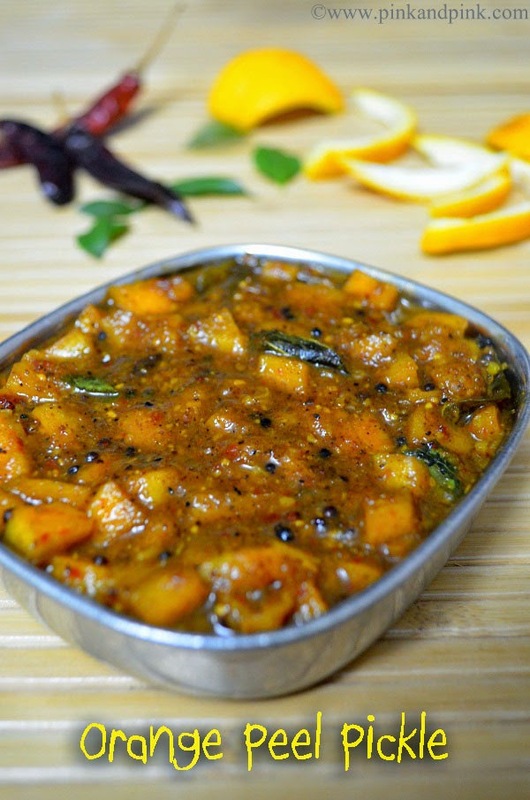 Absolutely brilliant and so easy, less on fat and easy on the palate!